Zoning attorney Peter Kelsen said the entrance must go on 9th Street at the behest of the streets department and the city’s Planning Commission. 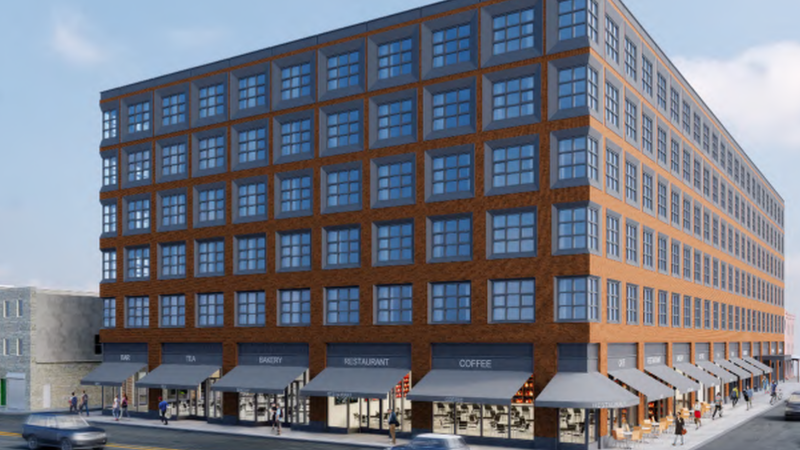 The Civic Design Review last week voted to delay the decision on its approval of a development at the southeast corner of 9th and Washington in the Italian Market neighborhood of South Philly. The development had been controversial in the community because of what neighbors feel was the developers’ taking advantage of a zoning change that allowed the developer, Midwood Investment & Development, to build a considerably larger building than was initially proposed. The plans initially called for a five-story, 70-unit apartment complex. However, when Councilman Mark Squilla had legislation passed that changed the zoning of the parcel from CMX2 to CMX3, Midwood upped the project to an eight-story, 182-unit complex, sparking community outrage. Since then, the Passyunk Square Civic Association has found a way to persuade Midwood into meeting them in the middle. As it stands, the project stands at six stories and 157 living units. But there’s still one major problem residents have with the project: the entrance to the parking garage is on South 9th Street. The residents want it on Washington Avenue. “We’ve gone back and forth with the developer and their team to get past a whole lot of issues that had to do with this project and we really just [can’t get past] this one last issue,” said Sarah Anton, PSCA’s president. The community and civic association are concerned that putting the parking garage entrance on South 9th Street will detrimentally impact the nearby Italian Market. Midwood’s zoning attorney, Peter Kelsen, said the entrance must go on 9th Street at the behest of the streets department and the city’s Planning Commission. This was corroborated by City Planning Commission staffer Alex Smith, who spoke at the meeting. “Staff believes that the curb cuts on South 9th Street are the best solution for this site, and while we do understand the community’s concerns about 9th Street being broken up by two curb cuts, the staff recommends that the applicant continue to work with the city and the community,” said Smith. Smith provided two reasons why the planning commission didn’t want the parking garage entrance on Washington Avenue. One, there are plans for a bike lane on the 800 block of Washington Avenue, which in the future might make cars entering and exiting out of the garage more dangerous for bicyclists and drivers; and two, the commission doesn’t want people making left turns across two lanes of traffic and a median to drive west along the corridor as they enter or exit the garage. Stober did his best to argue against both these points. The argument CDR Board Chair Nancy Rogo Trainer found most persuasive, however, was the civic association’s concern over precedence. “Other developers will come to the city and say, ‘Well, you provided a curb cut for the Midwood development on 9th Street, why don’t we get a curb cut?” Stober said. The board voted to request a second review before going forward with writing a letter to Licenses and Inspections, which is its only real power. The CDR board’s suggestions are entirely advisory and do not have any real binding power in whether or not developers meet their recommendation.